Sir Sydney Cockerell; Pierre Berès; London, Christie's, Oct. 7, 1957, lot 162; purchased there by Maggs Brothers Ltd., London for William S. Glazier (1907-1962), New York; deposited in the Pierpont Morgan Library by the Trustees of the William S. Glazier Collection in 1963. 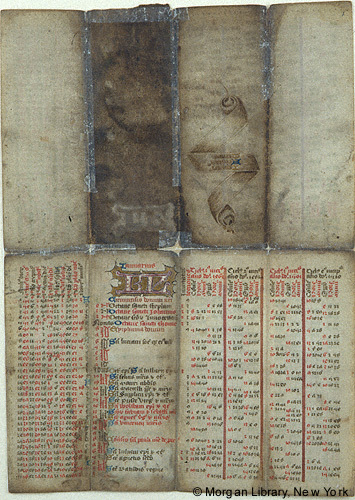 Ms. folding almanac; written and illuminated in England, ca. 1464. This ms., according to type, consists of 6 leaves, each folded three times, forming sixteen compartments (recto and verso). Decoration: 2 pen drawings: Zodiacal Man (fol. 6r), Vein Man (fol. 6v), 1 pen-drawn scroll with contents of leaf inscribed within, on each leaf, numerous illuminated and filigree initials; English Gothic style.